Summary: In some patients with spontaneous spinal CSF leaks, leaks are numerous or tears are so large that extrathecal myelographic contrast material is seen at multiple levels during CT, making identification of their source impossible. This study introduces a dynamic CT myelographic technique that provides high temporal and spatial resolution. In this technical note, we describe the utility of this technique in four patients with challenging high-flow spinal CSF leaks. Although many patients with spontaneous intracranial hypotension (SIH) recover without intervention or display a self-limited course, many do not (1). Some of these patients do not respond to multiple epidural blood patches and may require more targeted epidural injections, infusions, or surgical repair. In these patients, localization of the actual site or sites of CSF leak becomes important. In most patients, the site of leak can be localized by using conventional myelography with delayed CT imaging for slower leaks. When there are multiple leaks or large dural tears, the time delay during transfer between the myelographic portion of the examination and CT allows the extrathecal contrast to diffuse over multiple spinal levels, thus limiting the ability to localize the leaks. We define these as “high-flow” leaks and find them to be particularly challenging. After placing a 25-gauge spinal needle at the level of the second lumbar interspace, remote from the suspected location of CSF leak in each case, the patient was transferred in the left lateral decubitus position onto the gantry of a 16-channel CT scanner. Care was taken to position the patient carefully so that the hips were slightly higher than the shoulders, and the patient’s side was supported with foam pads to prevent any lateral flexion of the spine. The head was elevated with foam pads to prevent rapid flow of contrast material into the cranial vault. The standard CT technique included five scan acquisitions obtained during and immediately after injection of 15 mL 180 mgI/mL nonionic contrast material diluted in 15 mL of preservative-free 0.9% saline. Helical scans obtained by using 0.6-second tube rotation, 18.75 mm/rotation table speed, 0.94 pitch (International Electrotechnical Commission definition), 140 kV, and 260 mA provided coverage from the upper cervical to the lower lumbar spine in 15 seconds. The 16-channel scanner allowed a nominal reconstructed section thickness of 1.25 mm. The radiation dose for each acquisition was 21.11 mGy (CTDIvol). The helical data were initially reconstructed to fused 5-mm section thickness at 5-mm intervals by using standard soft tissue algorithm and selected images prioritized to allow rapid assessment of the ascent of contrast within the spinal canal. Before injection, anteroposterior and lateral scout images were obtained to determine the superior and inferior extent of CT coverage. To minimize time delays, additional scout images were not obtained between subsequent acquisitions. The first 15-second breath-hold acquisition was obtained from inferior to superior and was begun when half of the contrast material was instilled. Ten seconds were allowed for breathing and the second sequence obtained from superior to inferior. The needle was then withdrawn, and the patient quickly moved into the right lateral decubitus, supine, and prone positions with breath-hold sequences obtained in each position so that a total of five sequences were obtained. Selective focused delayed images were obtained as appropriate. The data were initially reviewed as fused 5-mm sections at 5-mm intervals. Vertebral levels were counted carefully by using rib morphology and comparison to the initial acquisition and scout images to ensure accurate counting of subsequent series. The images were reviewed for evidence of extrathecal contrast material. In the regions where extrathecal contrast material was detected, image volumes were reconstructed to 1.25-mm section thickness at standard soft tissue algorithm and oblique axial, coronal, and sagittal reformatted images reviewed on a free standing work station. Distinct foci of CSF leaks were identified when foci of extrathecal contrast that were spatially distinct on initial sequences appeared. These foci typically became confluent on later delayed sequences. Over the past decade, SIH has been diagnosed in an increasing number of patients, and a broader clinical and imaging spectrum of the disorder has been recognized (1–3). Most, if not all, cases of SIH result from spontaneous CSF leaks, and the overwhelming majority of these occur in the spine (4). Although the disorder is often self-limited, conservative therapy fails in many cases. In these patients, localization of the actual site of the leak has critical therapeutic implications. The rate of CSF leak can vary tremendously and is difficult to predict. We have found little correlation between the rate of CSF leak and clinical symptoms, MR imaging, or CSF opening pressure (4). For this reason, when conservative therapy has been unsuccessful, we typically perform a routine CT myelogram to localize the leak. If the rate of leak is low, it is helpful to obtain additional delayed CT images as much as 4 hours after contrast material infusion. Recently, gadolinium-enhanced MR myelography and MR cisternography (MR imaging after intrathecal introduction of gadolinium) have been reported as methods to improve detection of subtle CSF leaks (5, 6). A different challenge is faced when the rate of CSF leak is so fast that contrast material diffuses over multiple levels during transfer to CT. This is the challenge of “high-flow” leaks. Multidetector CT is uniquely poised to provide the combination of spatial and temporal resolution necessary to localize these high-flow leaks. With the 16-channel scanner used in this study, contiguous 1.25-mm sections of the cervical, thoracic, and lumbar spine can be obtained in one breath hold. The volume data sets created by these multichannel CT scanners can be unwieldy. Previewing the image volume by using fused 5-mm section thickness allows judicious selection of smaller subsets of the image volumes for thin section reconstruction. Image analysis on a workstation capable of producing multiplanar reconstructions aids interpretation. We found the oblique axial plane most helpful in displaying the site of leakage. The dynamic CT myelographic technique we describe requires CT imaging during the injection of diluted myelographic contrast material. Thus, the infusion of contrast material cannot be monitored under fluoroscopic control. Particular care must be taken in placement of the spinal needle and subsequent transfer onto the CT gantry to ensure subarachnoid location of the needle tip. The patient must be monitored for symptoms of epidural contrast material injection. In addition, to minimize the risk of seizure, care must be taken to position the patient in the lateral decubitus position properly so there is adequate cephalic flow of contrast into the cervical spinal canal without allowing rapid ascent into the cranial vault. One of the four patients in whom we performed this examination developed a brief seizure, lasting 30 seconds, immediately after contrast material instillation. With head elevation, the patient experienced spontaneous recovery and was able to complete the dynamic CT examination with successful localization of the leak. At a 3-week follow-up appointment, the patient had no further sequelae. We do not advocate using this technique for all patients with spontaneous intracranial hypotension who have failed conservative therapy. The rate of leakage varies considerably, and conventional CT myelography reveals the location of leak adequately for treatment in most cases. The dynamic technique is more invasive, has a higher radiation dose, and is more time intensive. 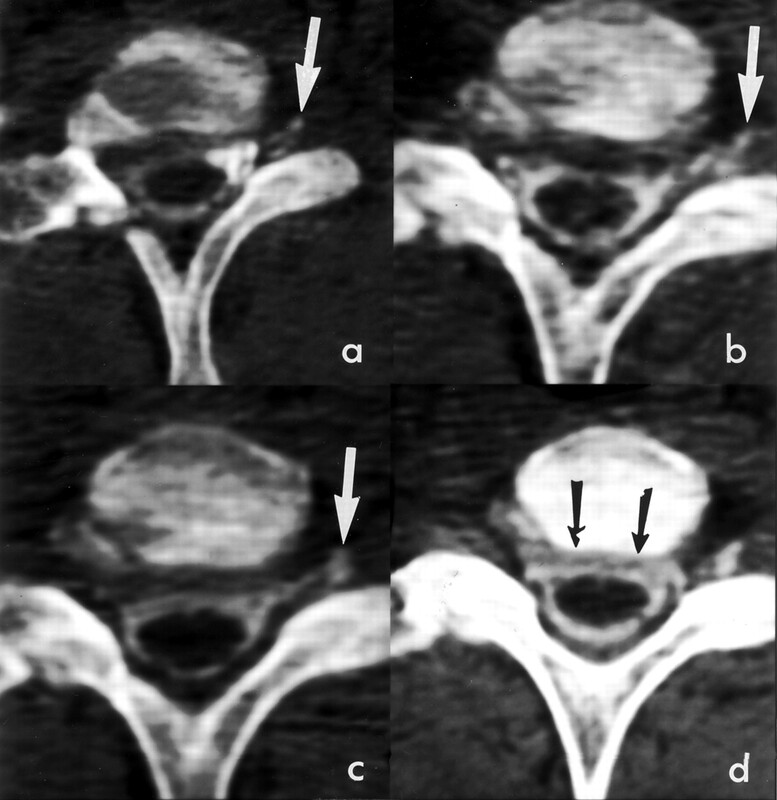 In our practice, we reserve the dynamic technique for the subset of patients with high-flow spinal CSF leaks who have failed conventional myelography. We have now used this technique in four patients with high-flow leaks and have successfully localized the leaks in all patients, including one particularly challenging patient in whom there were four spatially distinct foci of leaks (Figs 1–3). We have found this technique to be valuable in the evaluation of high-flow spinal CSF leaks. A 47-year-old man with a 4-year history of severe orthostatic headaches and tinnitus had documented low CSF opening pressures. Head MR imaging examinations showed diffuse pachymeningeal enhancement. 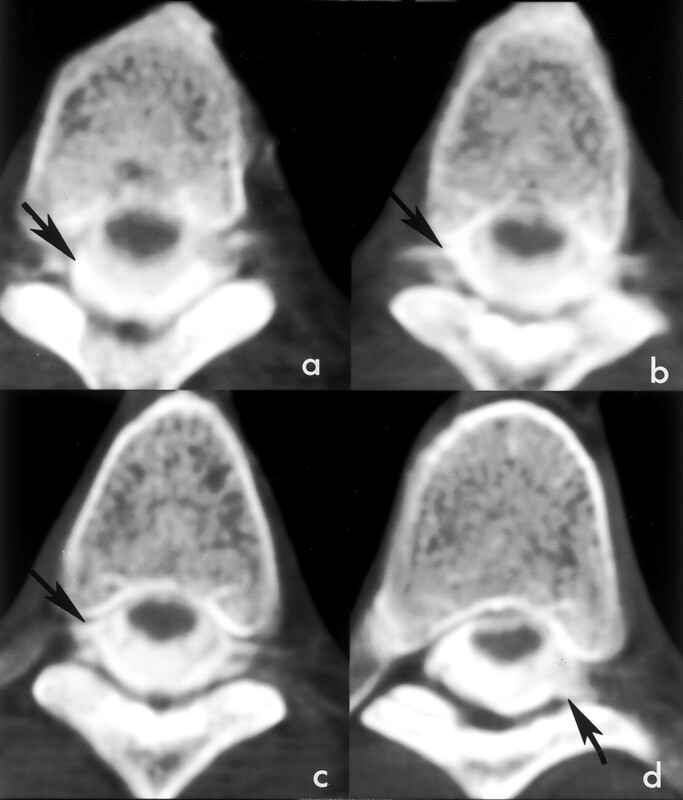 Selected images from routine CT myelogram at the T5 (A), T6 (B), T7 (C), and T9 (D) interspaces demonstrate diffuse extrathecal contrast material (black arrows). The study lacks the temporal resolution necessary to locate the site of leak. 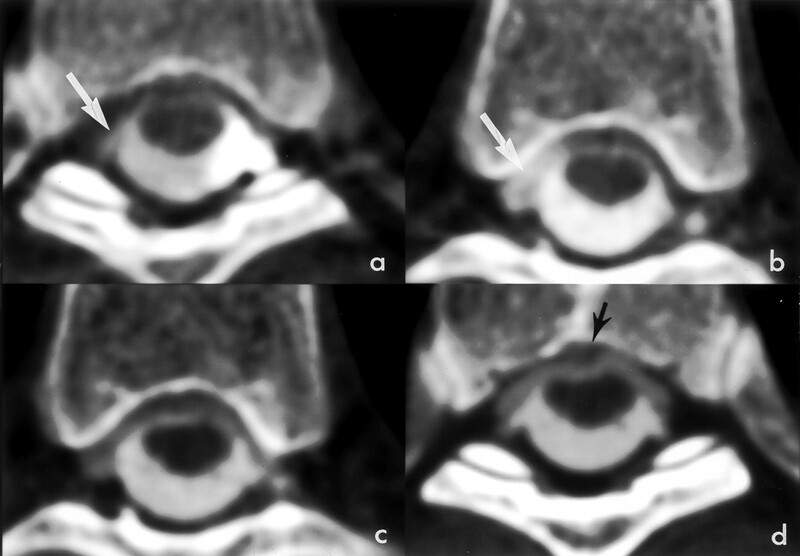 Axial dynamic CT myelogram at the level of the C7–T1 interspace in the left lateral decubitus (A), right lateral decubitus (B), supine (C), and prone (D) positions demonstrates accumulation of extra-arachnoid contrast material along the left C8 root sleeve (open arrow). The final prone images, which were obtained 30 minutes after injection of contrast material, demonstrate dilution of contrast material in the previously unopacified epidural fluid collection (black arrow). Additional leaks were located at the level of the right T6 root sleeve and along the ventral aspect of the junction of the right T9 root sleeve and thecal sac (not pictured). Accepted after revision April 21, 2003. Beyond superficial siderosis: Introducing "duropathies"